The last 72 hours are a blur. On May 25th, at about 4:35am, Pasang Kami (PK) and I reached the highest point on earth. 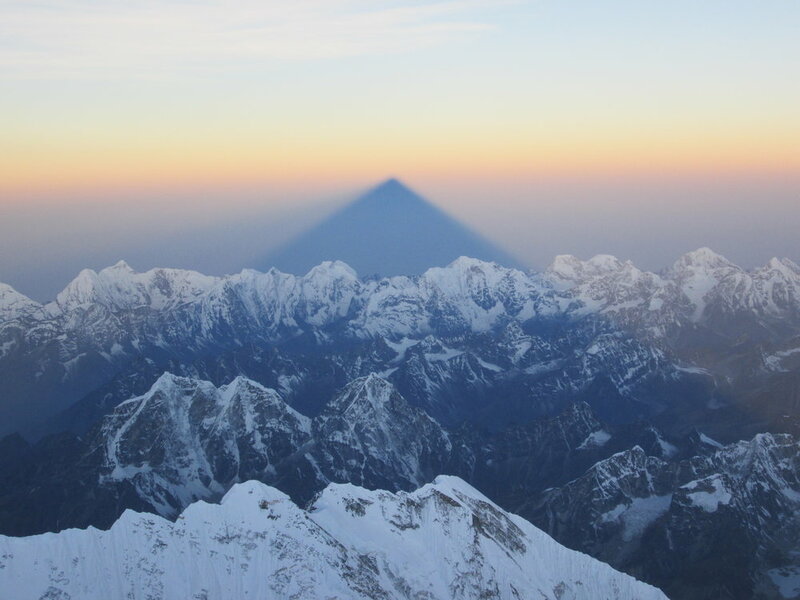 We watched the sun rise over the Tibetan plateau as Mount Everest cast a shadow stretching into the horizon. We reverently acknowledged the Buddhist prayer flags and photo of the Dalai Lama that someone had placed on the summit, and we mentally prepared ourselves for the decent, even as we snapped a couple of photographs. The climb to that point had gone almost flawlessly. PK and I left basecamp at 2am on May 20th and made it up the Khumbu Icefall and across the Western Cwm before the early morning sun began softening the snow. The Icefall and Cwm had changed dramatically in the week we had been at basecamp. Our earlier trails up the lower Icefall had become glacial rivers, and ladders that had previously spanned crevasses dangled helplessly into cracks that had doubled in width in the spring heat. The Icefall Doctors had continued charting new routes up the mountain every day, but even with their attention to the shifting terrain, we crossed multiple sections of the route where avalanches had littered enormous ice blocks over even the newest rope sections. After we crossed the last ladder, we were relieved that we only had to face this peril one more time. At Camp II we rested the afternoon of the 20th and all of the 21st, gaining strength for the 3-day push we would make to Camp III, IV, and then to the summit. On the 21st, the jet stream started shifting, so that the 25th looked like it would be a bit less windy on the summit than the 24th. Targeting lower wind speeds, we rested at Camp II another day, eating as many Oreos, quesadillas, and fried eggs as we could between movies and book chapters. This sojourn at Camp II was much more somber than our prior two. All of us were nervous about the summit, and we were so scared of catching a cold from each other that we minimized socializing and card playing. On this second rest day (the 22nd), IMG Team One returned to Camp II after their successful summit. 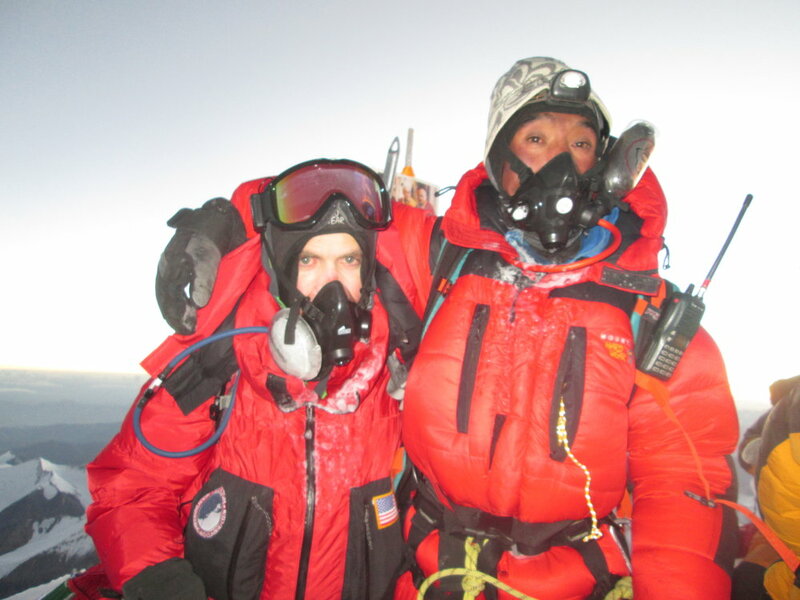 100% of their team's members had made it to the summit, in near-perfect conditions. I won't comment on their individual experiences, but I will say that they looked crushed. Even the fittest guys in their team looked like they had just finished one of the toughest days of their lives. Some appeared to have lost 15 to 20 pounds in the few days since I had seen them, and many of them had sunken eyes and a cough that reflected the extreme dryness of the summit. One of the biggest and strongest guys on their team wept openly outside the Camp II dining tent, visibly shaken by the stress, exhaustion (and probably emotion) of summit day. Another guy described the emergency situations he had witnessed in the 'death zone' above 8,000 meters and his efforts to help as much as he could at near impossible altitudes. 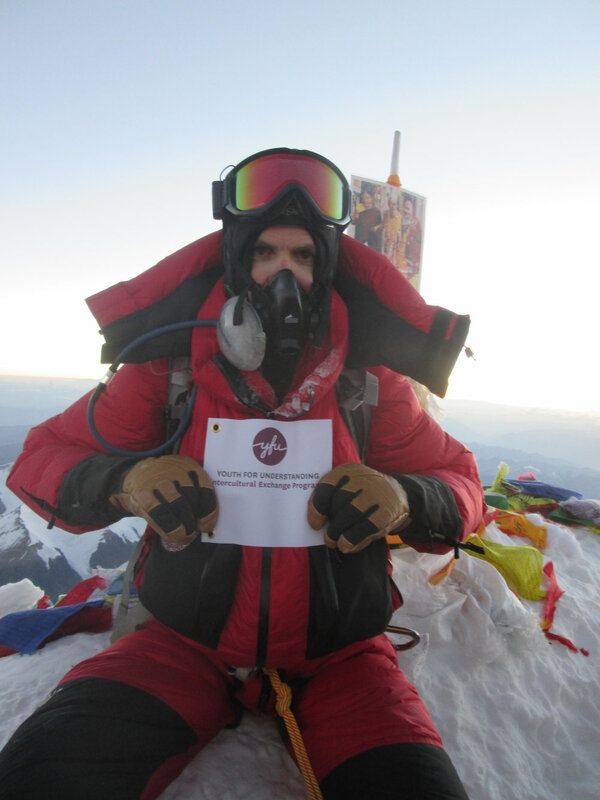 Our Sherpa proved heroes once again on Team 1's summit day, as they helped with a rescue above 25,000 feet. Seeing all of this made me nervous for my summit day and wonder if I should have pushed harder to ascend with Team 1 vice Team 3. I barely slept that night, and at 4am on the 23rd, I started back up the Lhotse Face toward 24,000' and Camp III. We climbed the last 1,000' up the Western Cwm from Camp II to the bergschrund (the crevasse separating the Lhotse Face from the rest of the Cwm), and as I climbed the ladder onto the face a steady stream of snow rained down on me from the Face. At first, I thought it was just a little bit of snow knocked loose by climbers above the bergschrund, but after about five minutes of hanging onto the ladder like my life depended on it while snow cascaded down onto me (filling my backpack and cracks in my clothing layers), I realized I would need to climb through the cascading snow, which was being scoured off the Face by 15-25mph winds. I buttoned up my jacket and put on my goggles as I braced myself from the wind. I felt much stronger climbing to 24,000' than I had a week earlier, and the dozens of climbers who had preceded us to the summit had kicked visible steps into the blue ice slope. My good friend (and Wharton Mountaineering Club co-founder) Jason had beaten me to Camp III by a few minutes and he grabbed us a tent. We donned the oxygen masks that we would not be taking off for the next 48-60 hours, adjusted the O2 regulators for our resting state, and had a good laugh listening to (and rapping along with) the song "Regulators" by Warren G. Making ramen noodles, oatmeal and MRE's takes a lot longer at 24,000' than at 21,000', and before we knew it the day was done. We started climbing to Camp IV early on the 24th, so that we could beat the heat of the sun reflecting on us from all sides of the Lhotse Face and have more rest at Camp IV before summit day. The climb was more of the same: ~2,000' feet of blue ice wall; but this time, ice climbing was punctuated by the Yellow Band (a strip of yellow rock circling Mt. Everest) and the Geneva Spur (a rocky spur we needed to ascend just before the South Col and Camp IV at ~26,000'). Climbing on supplemental oxygen at 1.5L per minute was like a nitro-boost (even though they say that each liter per minute of supplemental oxygen only simulates a 1,000' drops in elevation), and I felt strong and safe throughout the day. The moment we crested the Geneva Spur and traversed into the South Col though, everything changed. The wind on the 23rd had turned out to be ferocious and would continue until the evening of the 24th—just before we began our summit push. 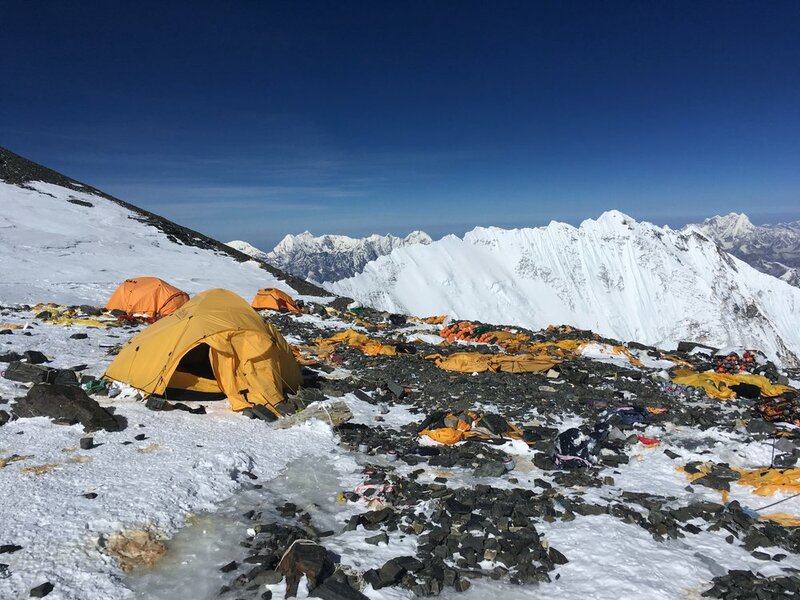 All of the tents that Team One had used at the South Col had been shredded by the wind or blown off the mountain entirely. Wreckage, oxygen bottles, trash, and human waste were everywhere, and it was unclear how much of it was from this year. Jason and another teammate and I crawled into a tent and hunkered down to rest for as long as we could in the afternoon before our nighttime assault on the summit. As predicted, the wind died down in the early evening, and at 10:15pm we started marching toward the summit. Our group spread out, and within 30 minutes, it felt like Pasang Kami and I were alone on the ridge. My philosophy for mountaineering (and endurance sports in general) is to maintain a pace that I can control, so that I never hit the wall before I want to "empty the tank." On Mt Everest summit day, this meant zipping up my down suit and taking two breaths between each step up the mountain. The new moon left the mountain pitch black, and so for most of the climb, the only thing I saw was the circular patch of light from my headlamp; and the only thing I heard was the sound of my own breathing through my oxygen mask. Breath. Breath. Step. Breath. Breath. Step. Breath. Breath. Step. My hands and feet were warm, and the hood of my jacket was blocking the little bit of wind that might have otherwise frostbitten the patch of skin between my goggles and my oxygen mask. This was sustainable. I felt like I was going impossibly slow, but we were getting farther and farther ahead of the bulk of our expedition and I knew that as long as the pace was sustainable, the pace would not really matter. Where people get in trouble in the death zone is when they stop. As long as I didn't stop, eventually I would run out of mountain. Just as I got into a groove, I saw a spot of black in the snow next to our rope. I swung my headlamp over and saw a pair of boots, identical to mine. I turned my head some more, only to see a pair of down pants, identical to mine. I turned my gaze up and saw an arm sticking out of the snow with a bare hand obviously reaching for something. The man was still tied into the rope we were following, suggesting he had died very recently. The frozen, outstretched grasp—combined with the fact that he was dressed exactly as I was—created a surreal experience. I mourned this man's death, even as I re-committed to myself that for me, this mountain was not worth losing a finger or a toe, much less my life. I was well into the death-zone, and I would keep my head about me, caring for myself as necessary until I was back below the South Col. Another hour of breathing and stepping, and we reached the Balcony—a rocky overlook where we could take a break on flat ground. Pasang Kami helped me switch into a new oxygen bottle for the rest of the summit push and I ate 3 mini packs of cookies (anything with lots of calories that won't freeze in negative 35 degree temps). We sipped some water and then continued toward the South Summit. The ridge continued to get steeper, and I was glad I couldn't see how far it dropped off on either side. We scrambled up rocks for a portion of the trail, and soon I couldn't feel my left toes. I wasn't sure whether I had lost feeling due to the cold or due to the sharp angle that I was bending my ankles, but my concern grew when I wiggled them and still couldn't feel them. I pressed on until I saw a slight break in the steepness of the ridge, and I asked PK if we could stop. Steadying myself against the slope, I swung my leg vigorously 6x 20 times. The centripetal force moved blood down my leg into my foot, and soon I felt a tingly rush toward my toes as my nerves reactivated. I think I did this at just the right time, based on how cold my feet had become and how long it took to fight to get the feeling back in my toes. It felt stupid while I was doing it, but I think it was a crucial decision in favor of taking care of myself, even if it meant slowing down a little bit or inconveniencing myself with a stop during such a cold night. When we reached the South Summit (~28,800') I forced myself to stop again—this time for more food and water—and again I think it was the right call. I wanted to avoid freezing and exhausting myself to the point that I did something stupid like fall off the mountain, and avoiding those things was worth any delay or inconvenience it might require. At the South Summit, I was feeling blasted—I forgot how much lack of oxygen affects you. The only thing I wanted to do was curl up next to a nice rock and sit for a while—maybe even take a little nap. Yeah, a nap at 28,800' at 3:30am in -35 degree winds sounded like a great idea. But of course, this is exactly how people die. They push themselves to the point that they can't fight back against such thoughts. I would not succumb. It didn't matter how slowly I moved, but I had to keep moving. I stretched out my pace to one step every four breaths and continued on. Traversing the ridge between the south and true summits provided a jolt of adrenaline, as the first rays of the sun revealed a five thousand foot drop on either side. The famous Hillary Step it seems was knocked off the mountain in the 2015 earthquake, and in its place was a mixed rock and snow scramble. By the time the summit loomed in front of me, I really didn't care about anything other than getting to a place where I could take a nap without dying. Jason was coming down from the summit just as I was approaching, and I absent-mindedly continued putting one foot in front of the other until I was standing on top. I no longer cared about food or water. I didn't care about the view, and I barely noticed the landscape around us. Were it not for another teammate pointing out Everest's shadow touching the horizon, the only photos I would have gotten would have been a couple of me on the summit to prove that I had been there. I was thinking only about my fingers and toes (and making sure I could feel them) and on the focus I would need to descend safely. We left the summit around 5am after about 20 minutes on top, and within 30 minutes we were back across the ridge at the South Summit. I popped all of my caffeinated GU's for the descent and began walking slowly and deliberately downhill. Descending is the most dangerous part of summit day, and it took everything I had (plus breaks every 100 vertical feet or so) to make sure I didn't lose my balance and slip down the mountain. By the time we reached the South Col, we had been moving for about ten hours and I was wiped out. 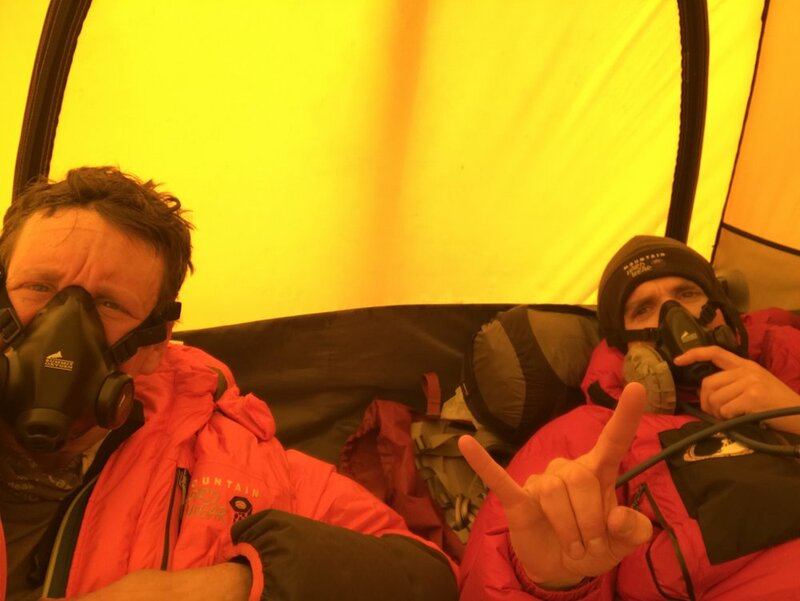 We rested for an hour and then began descending a vertical mile down the Lhotse Face. By the time we got to Camp III, I needed another long break, and at the bergschrund (only 1,000 vertical feet to go to Camp II) it felt like I was on some kind of cruel death march. This was when my experience as a rower and marathon runner kicked in. The louder my muscles and feet screamed at me to stop, the more I thought of my body as a machine and not an organism. I removed the element of choice from the descent. I would continue moving, and my legs and feet would continue walking, no matter how much it hurt. Arriving back at Camp II at 4pm (18 hours after we had started for the summit), I drank almost a half gallon of water before eating two bowls of ramen noodles and going straight to bed. We started walking down the Cwm on May 26th at 4:45am (so that we could cross the Icefall before the sun hit), and by 9:30am Jason and I were in basecamp, dealing with blisters and eating hot grilled cheese sandwiches. Jason and another teammate allowed me to fill an empty seat on a helicopter they had chartered back to Kathmandu that afternoon, and so by 4pm Friday (just 24 hours after we ended our summit day) we were sitting in a nice hotel in Kathmandu, repacking our bags for our flights home. So what does it all mean? What did I learn? And what's next? I'm not sure yet. I don't think it's really sunk in yet. The summit was such a hypoxic blur, and the transition off the mountain went so fast, that I don't yet appreciate what happened. I plan to register with 7summits.com as the ~150th person to complete both the Carstensz and Kosciuszko versions of the 7 summits, but I'm not sure what other significance to attach to the accomplishment. In my head, I've been comparing the last few days to the days immediately following the 2005 National Rowing Championship, and the two feel surprisingly different. In 2005, I was shocked that we (our boat) had actually trained that hard and effectively that we could beat out every other varsity crew in the country. I was equally shocked that I—a walk-on with no prior rowing (or even athletic) experience—had not just made the varsity boat but had actually helped the varsity boat be the best in the nation. That victory was an epiphany for me, because if a guy with as little a clue as me could eventually become a national champion rower, than really anybody could do just about anything. The end of this 7 Summits journey is quite different, because I began it already believing that anything was possible with a little time and attention. So concluding this journey feels more like reinforcement. There were things I needed to do to complete the 7 Summits (save up money and time, learn how to ice climb, and build experience with high-altitude mountaineering), and over the course of 8 years, I did them. I did them both because I wanted to finish what I started, and because I genuinely love expeditionary mountaineering. But I guess the biggest "takeaway" I have is to do what you love—because life's too short to live other peoples' dreams. I learned a lot of stuff about mountaineering along the way too, but more than anything, I have finished the 7 Summits with a deeper understanding of who I am and what I like and a greater confidence choosing those things that are right for me, vice those things that friends, colleagues or loved ones might think are best for me. It's not that I don't value or ever heed others' advice, but rather I know now (deep down) that I am the one who will have to live with my decisions and that I therefore need to ask myself what's right for me and why. To thine own self be true. As for what's next… I still love the mountains, and I expect that I will always be interested in random climbs like the Matterhorn, Eiger, Mt. Blanc, and Alpamayo. But I don't think I'm going to burn every vacation day each year in the mountains anymore. 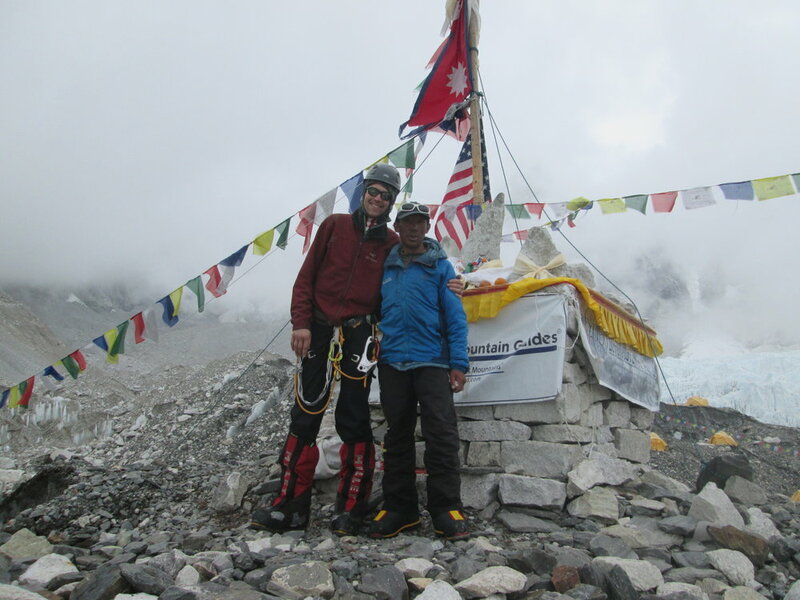 Plus, there are other cool things that I have not pursued, due to my focus on the 7 Summits. At the moment, I think I may focus on (i) orienteering, (ii) martial arts and/or (iii) competitive ballroom dance, but this could all evolve over the next few months. Whatever it is though, I know this is true: I am happiest when I am choosing for myself and fully devoting myself to life. I want a full and rich life, and I get there by knowing myself and living with vigor. One other thing I am certain of is the power we have to change the world by enabling our youth to experience a foreign culture. Once a teenager understands the idea that a cultural difference is not necessarily good, or bad, but different, they become permanently more empathetic and curious about the human race. And the better we can understand one another, the easier we will be able to work together to promote our global well-being. Thanks to your support, we not only beat our goal of raising $20,000 for Youth For Understand (YFU), we also surpassed our revised goal of raising $25,000 for scholarship aid. Thank you again.